You lose when you don’t write. But you don’t win this game by beating others to the finish line. You win by having a superior command over your own mind. That’s what peak performance is about. Always giving your best. The key to giving your best is in the language that you use. Because how you describe your experience has a direct impact on your experience. 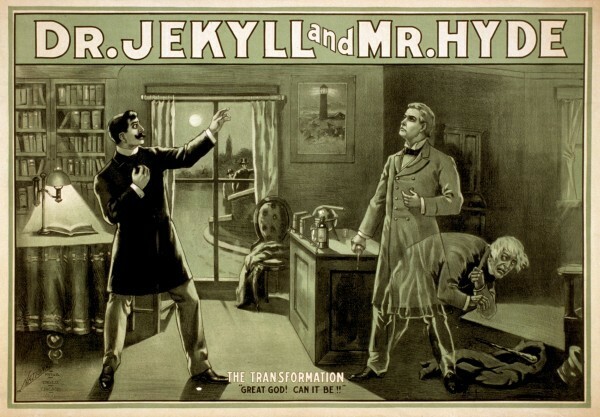 Everyone talks to themselves (no, you’re not crazy!) but we don’t always say the right thing at the right time. And if you want to have the greatest impact on your songwriting, you’ll need to examine the language you use as you write songs. Not just the words you use in your songs, but the words you use in your creative process. If you struggle with indecision, writer’s block, or are generally unsatisfied with the quality of your songwriting, improving your language will focus your mind into giving your very best. As you read this article, pay close attention to your language as you react to these ideas. Notice if your language creates an environment for deeper understanding or if you could make better choices. I’ll even give specific examples of language you may be using and how to improve it. 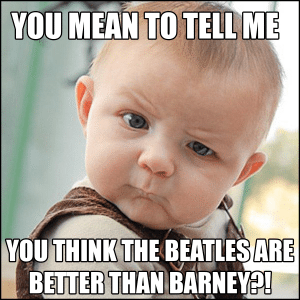 Are The Beatles Better Than Barney? Depends Who’s Listening! To a 2 year old, your favorite music probably doesn’t get the respect it deserves. And I bet you’d rather not listen to the Barney theme song 100 times in a row. So quality is in the eye of the beholder. Stop focusing on quality as you write. In my Speed Songwriting System, one of the first lessons is a little mini-course called How to Write a Bad Song in 7 Steps. 1. To give beginner or advanced songwriters an opportunity to try out the method quickly, without being slowed down by concern for quality. It’s counter-intuitive, but why worry about quality when you’re just learning a specific songwriting technique? Students get better faster when they have a simple step-by-step system they can follow. Learn the technique first, and then focus on the content. When songwriters focus on quality as they’re learning, they slow themselves down. They’re always looking for the “best” option instead of getting the process down so it feels like second nature. To get into a creative flow where you’re performing at your best, stop judging yourself and your work. When you catch yourself expressing opinions as if they were facts, ask yourself process-focused questions instead. Creativity loves speed. Nothing stops it dead in its tracks worse than over-analyzing, harsh judgment, or fear of not being good enough. 2. To give songwriters the experience that it actually requires an extra effort to write a song that’s bad quality. 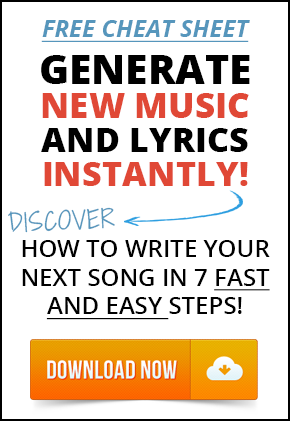 “Writing A Bad Song Fast in 7 Steps” is a fun exercise. You get to write outlandish lyrics and some of the most un-musical ideas you can imagine. But you discover that it takes skill to write something terrible because you have to overcome your natural impulse to create quality. And that’s hard to do. It’s evolutionarily advantageous for us to create things that survive and have value. You can trust that you’re pre-wired to strive for survival and continued success. It’s a given that every musician I coach or talk to strives for good quality. Since quality is pre-wired in your songwriting, you can stop focusing on it and just let it happen naturally. Focusing on quality as you write slows you down and hinders the creative process. Remember, if you’re always looking for the “best” option, you’re stopping the idea generation process and moving into the idea evaluation process. Both processes are good, but doing them at the same time is a bad idea, and I’ll explain why in the next section. The highest quality comes from those who create the most quantity. I believe you should value quantity over quality. The songwriter who writes 100 songs is always better than the songwriter who writes just one. Feel free to prove me wrong. But you’d have to write fewer songs to do it. And I hope you write more songs, not fewer. 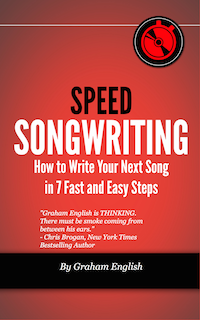 That’s why I created the Speed Songwriting System. To help you write more and get better faster! The Victor and Defender are both important but very different parts of ourselves that can cause major creative conflicts. When you gain, you win. You get pleasure from generating ideas. It’s as simple as that. Idea generation is the same thing as pressing a pleasure button in your brain. So why do we feel down on ourselves sometimes? Why does it feel painful to come up with ideas that don’t immediately please us? That’s the other side of you, “The Defender,” the one that doesn’t want to lose. The Defender takes your ideas, compares them to other ideas, and determines how they rate. The Defender likes to puff its chest with supreme authority, but there’s very little absolute truth in the relative world of art. Art is subjective. It would be nothing without someone to evaluate it. Evaluating is just as important as creating, and the Defender can give you all the reasons why your art is good…or bad. Idea evaluation is like pressing a pain button. The Defender releases a different kind of chemical (cortisol) that doesn’t feel so good. The Defender doesn’t want us to feel pain, it wants us to eliminate the pain. It’s our security alarm. If we never evaluated our ideas and just spewed everything that came out of our minds, the Victor would look pretty foolish (with lots of typos). Pleasure and pain. Winning and losing. Both are crucial motivators that are pre-wired into our brains. So what’s the conflict about? Even though you need to generate ideas AND evaluate them, you can’t do BOTH well at the same time. Stop evaluating your art as you create it! When you evaluate the raw ideas you’re generating, you won’t be motivated to create because your ideas get judged before they’re even formed. If you can get out of the evaluative thinking space, you can generate more creative ideas. When you need to generate ideas, think about what you’ll GAIN or how you’ll ADVANCE. When it’s time to evaluate your ideas, think about what you could LOSE or things to AVOID. What Good Things Will Happen To Me? How Will I Be Better Off? What Bad Things Will Happen To Me? How Will I Be Worse Off? These questions will focus your mind into giving your very best precisely when you need it. Fear is good. You can’t have courage without it. Without fear, you wouldn’t avoid potential harm. But ultimately, you want to be the Victor. You want to bring the Defender out when you edit, and that’s all. Mastering the Generating/Evaluating Pattern is one of the most courageous things you can do because it puts fear in its place. And when you examine your language patterns, you discover beliefs, values, and presuppositions that you can improve or abandon altogether. Examining yourself in this way is also very courageous. Finally, be brave enough to trust in your natural impulse to create quality content. You’ll never please everybody all the time (including yourself) and that’s okay. Want to lose your fear? Stop evaluating and start creating. You win the inner game of songwriting by writing. You lose when you don’t write. 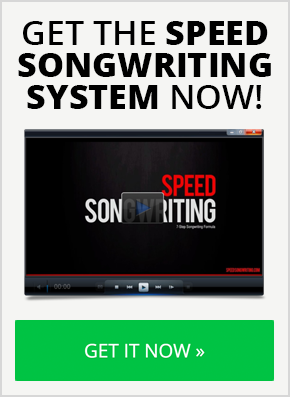 If you need help with the songwriting process or just want to improve your skills, you can try my Speed Songwriting System. The one thing I know for certain about you is that you’re thinking about songwriting as you read this. I admire your dedication. Thanks for this post. Really great stuff. I find myself getting hung up on changing things up and creating contrast in a track. I think this will help me by allowing me to make a bunch of ideas and let most of them be bad, and then go back and evaluate to pick my favorite. As Zappa used to say about song writing, you have to just crap it out, and then take a look at what you’ve got. And Zappa was as prolific as they come! Thanks for the comment! Awesome read. Thanks for this – I really needed it! Those were some very interesting thoughts, amigo! I think u came up with some very clever ways of explaining some concepts that apply uniquely to the creative process ! U could have been a psychologist …! Very accurate and succinctly put, I gained tons from this and thank you!